The well known clothing brand Khaadi has come along with newest cambric collection of midsummer 2015 for ladies and girls. In this cambric collection, you can easily find both straight and long shirts with churidar pajamas, pants or trousers. This time, the Cambric collection by Khaadi used dark, bright and light colors such as royal blue, red, purple, orange, green and so on. This cambic collection is vividly paired along dupattas and salwar or tights. Khaadi brand name is popular inside Pakistan and also round the world. Khaadi comes in this field in year 1998 and still its clothing is on high demand. 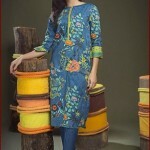 The key reason is the fabrics which are used by Khaadi are totally outstanding and expensive as well. This brand in now targeting ladies or women of all ages and in coming future it will target men and kids as well. Khaadi Cambric Autumn Collection 2015 has been released as well as accessible at every fashion store or outlet inside Pakistan. All these cambric collection are in embroidered or printed designs which will be hopefully liked by Khaadi customers. 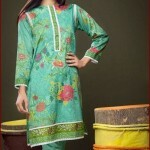 This collection is adorned with diverse fresh and bright colors which are inn in summer season. 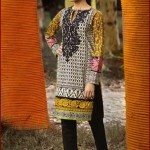 Beside cambric collection, ladies or girls can also buy lawn dresses of both printed and embellished form. Summer collection 2015 by Khaadi includes prêt wear, hand woven, stitched and unstitched suits and kurtis accessible at different rates. This cambric collection is obtainable in 2 piece and 3 piece suits so it is up to you whether you want to buy 2 piece or 3 piece cambric collection suits for coming Eid. This collection of cambric autumn is getting inspired by art and standard of western &b eastern style and is ornamented along with pure and fine intricate pattern & designs of embellishments plus striking shades. So be ready for enjoying cool and bright colors of apparels offered by Khaadi. 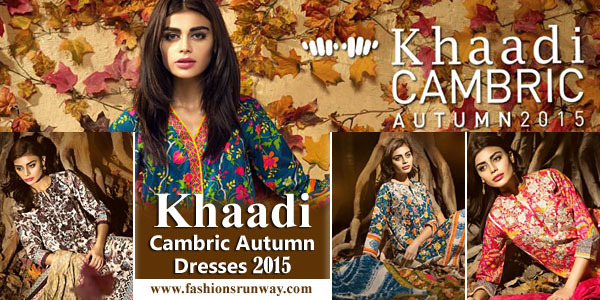 Check below here Khaadi cambric autumn collection 2015 full online catalogue with prices.